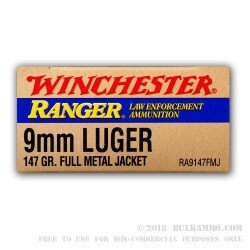 This 147 grain 9mm FMJ Ammunition is produced by Winchester, which is owned by OLIN Corps. 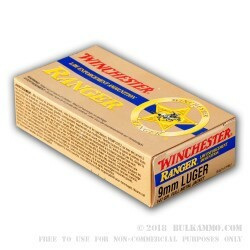 Winchester produces clean, quality ammunition known for it’s reliability and accuracy. 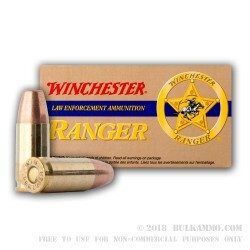 This Ranger 9mm 147 grain FMJ is a heavy cartridge designed for target practice and training. 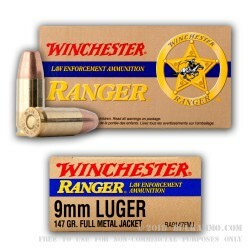 The Winchester Ranger Line was specifically designed for law enforcement use, but has found a popular place with shooters all across the USA. 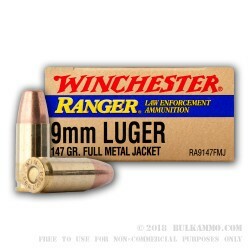 As stated above, this is 147 grain ammunition with a full metal jacketed copper over lead. Tis ammunition has a muzzle velocity of 985 feet per second, and has a standard muzzle energy hovering right around 317 foot-pounds. This is brand new production ammunition. 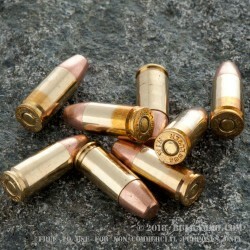 Casings are brass. 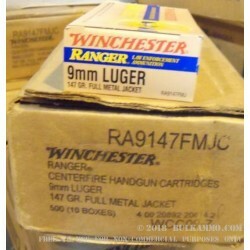 Cartridges are boxer primed and fully reloadable.